After living with the photos of my set-up for a week, I decide I’m happy with it. 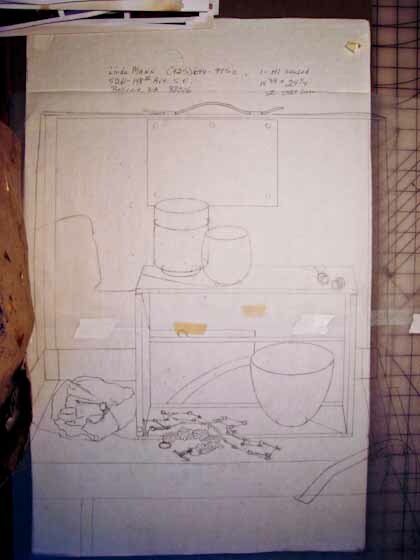 The next step is for me to do a full-sized detailed drawing of my composition. First, I decide what size I want my finished painting to be. As a rule, I like to paint life-size. Especially with still-life, this gives the viewer a sense of immediacy, as though the painting were real. In this case, however, I find that life-size yields a very big painting, so I decide to down-size a bit. I draw a rectangle of the decided-upon size in the proportions of the view-finder I used when setting up the composition. Now, I draw! 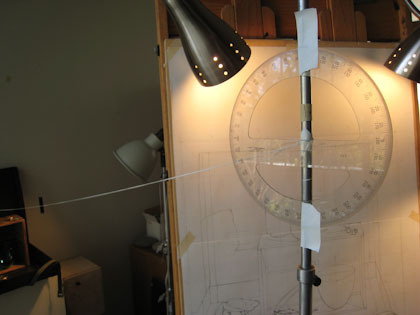 I establish the vanishing-point so that my perspective is realistic. The vanishing point is at my eye level and directly in front of me. I mark this on the paper (or on my easel, if it’s off the paper!). All parallel lines will converge to this point. Circles in perspective are drawn as ellipses. The closer the circle is to my eye level, the more shallow the ellipse, the further down, the closer to a full circle. To draw these accurately, I have to find the circular object’s angle below my line of sight. 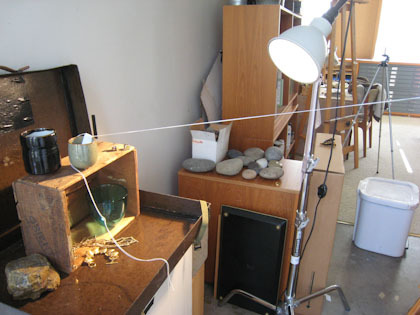 To do this, I run a string from a post at my eye level to the circular object in my set up. I measure the angle the string makes with the post with a protractor. Armed with this number, and the length of the major axis (the diameter of the circle in the drawing), I can calculate the correct ellipse. 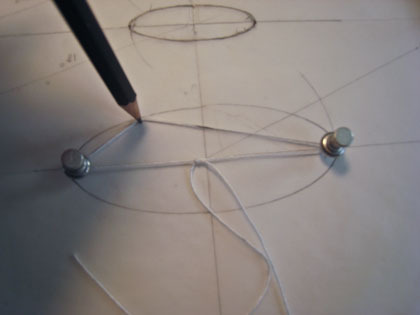 This I do using string, two pins, and a pencil. (I’ll explain in more detail how to do this in a future post.) It’s low-tech, but it works! 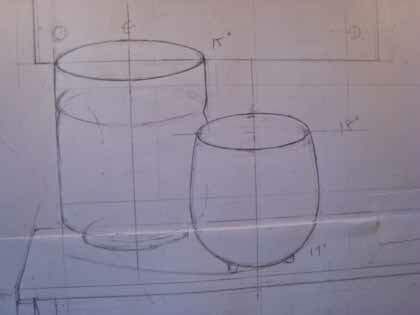 Using tracing paper, I transfer the correct ellipses to my drawing. Here’s the finished drawing. My next step will be painting a full-size black, grey and white study.